Last night I picked up an amazing dresser that I purchased via Craigslist. The sellers had a gorgeous 100 year old home in the Linden Hills neighborhood of Minneapolis, one of my fav garage sale haunts. Their house was stunning, and their decor was equally fabulous. However, I always feel a little sad when I see one of these houses that has been entirely re-done inside. 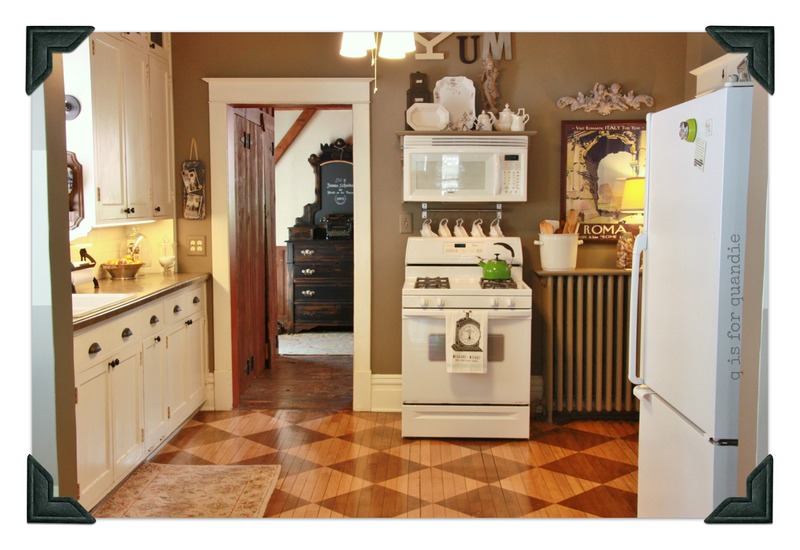 Some of the original features were retained such as doors and crown molding, but the kitchen was obviously a complete gut job. They now have marble counter tops, stainless steel appliances and modern looking dark wood cabinets. Again, stunning, but yet it still makes me a little sad. I wonder what the original kitchen was like. This brings me to my kitchen. I have tried to retain the quaint 1900’s farmhouse quality over the years. I’m not saying that my way is better, it’s just my preference. When we moved in to our house in 1987 the kitchen was mustard yellow and country blue and fully wallpapered. Here is the only photographic evidence of that time. Sorry Annie, Chris, Kurt & Mike. I have totally published this picture without permission, but you look great in it, so no biggie, right? Annie, you have always been amazingly photogenic. Even in the 80’s. 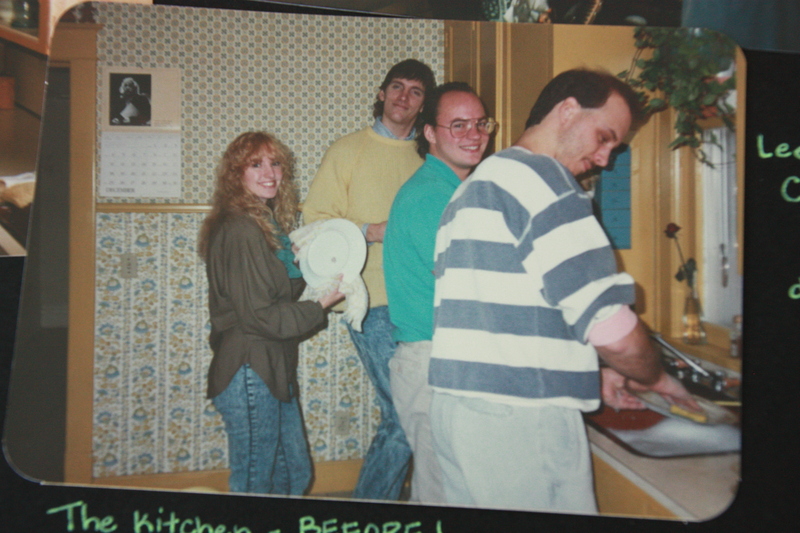 We have made a lot of changes to the kitchen since then. It first went through a period when it was peach and navy blue, with a fruit themed wallpaper border. Ah yes, remember the hey day of the wallpaper border? Strangely enough, I don’t have any pictures of that version of the kitchen. Then in 2006 we decided a more thorough remodel was in order. It was another case of the domino effect. It started with mainly wanting to put in new sink and counter top and do some painting. In the end we tore out the plaster and removed particle board ceiling tiles and then added new sheet rocked walls and ceiling, re-wired the electrical and added lights over the counters and more outlets, ripped out a vinyl floor and refinished the original wood underneath and widened the opening to the next room. Yikes! As you can see, we have very limited counter space. We’ve thought about adding an island, but it would be smack in the middle of a major traffic area since we have to walk through the kitchen to get to the bathroom, and to get in and out of the house. If you are wondering about the floor, yes you read that right earlier, this floor had been covered up by vinyl. Mr. Q spent hours and hours removing the approximately one million little staples holding it in place. We then had it sanded, and the checkerboard stain added (the dark squares are stained, the light squares are natural). This is my wall of cupboards. It’s plenty of cupboard space for us. Originally the top row of cupboards had solid doors just like the rest, but they actually were mostly empty. We have to stand on a ladder to reach them, and just didn’t need to store things up there. So, I decided to cut out the doors and add chicken wire, then display my collection of ironstone up there. In hindsight, I really wish I had thought to add lights when we re-did the wiring, but dang it, I didn’t. Still kicking myself over that one. We did add a subway tile back splash and the under-cabinet lighting. Our kitchen is very basic. We don’t have a dishwasher, or any fancy appliances. No ice maker in the fridge, no gourmet gadgets. 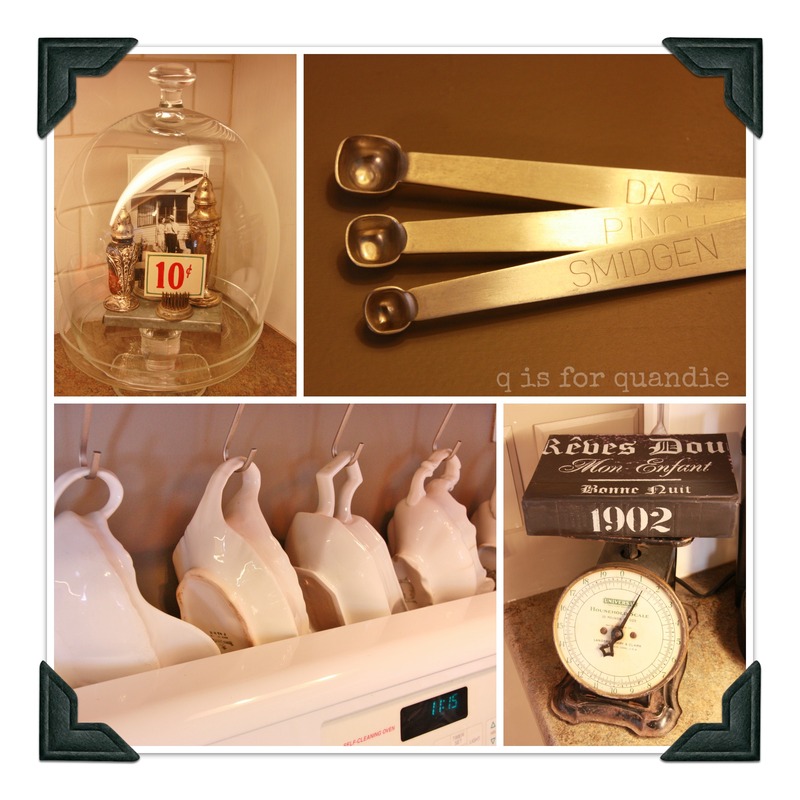 Most everything I decorate with comes from garage sales. The child sized folding chair came from a sale, I painted the seat with chalkboard paint, added a metal number tag and hung it on the wall (Although, to be honest, first I put it in my occasional sale and no one bought it. I believe the price was $22. How is this even possible? Look how cute it is!). 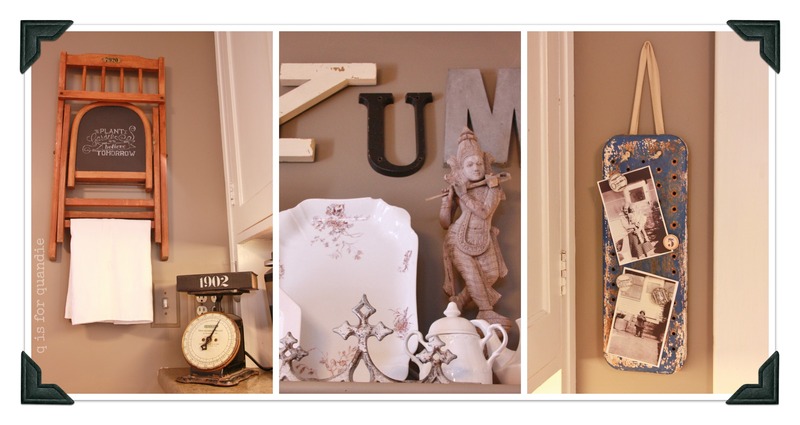 The fabulous carved wooden Krishna statue came from a garage sale too, and the blue metal bike seat/message board came from The Cottage Sale put on by Josie Jones (as you can see, I love it Natalie and it fit perfectly in this spot in my kitchen). 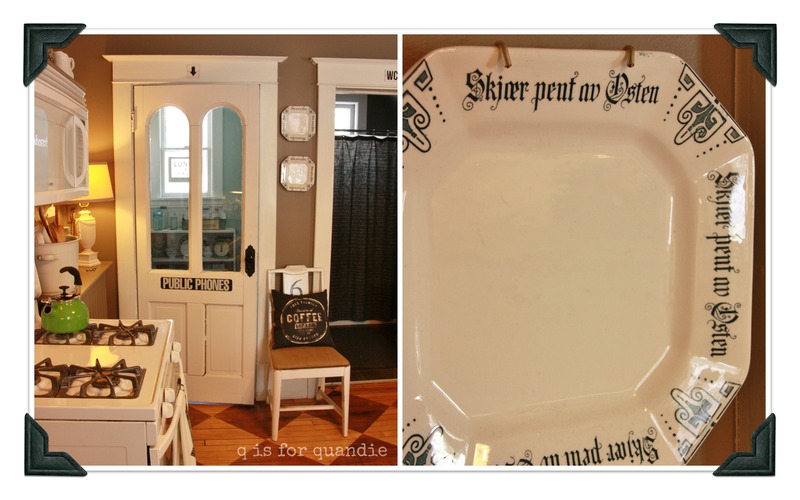 The Norwegian cheese plates that are hanging on the wall above the chair are garage sale finds as well. Aren’t they fantastic? I paid a mere $1 for the pair. I did some research after I purchased them and learned that the phrase on them, skjær pent av osten, translates to something like “treat the cheese nicely” and was meant as a reminder to slice the cheese evenly so that everyone got their fair share … or something like that. They are a nod to my Norwegian maternal grandparents. Thank you for taking a tour of my kitchen today. If you ever stop by, I may not cook you a meal, but I would certainly open a bottle of wine and serve you some cheese that has been treated nicely. Previous a winter’s night dream. I really like this one! I do cook sometimes in your kitchen when I come to visit. Well bake more than cook. Love the old picture too. The no dishwasher thing must run in the family. You should have mentioned the old coffee grinder hanging above the sink. 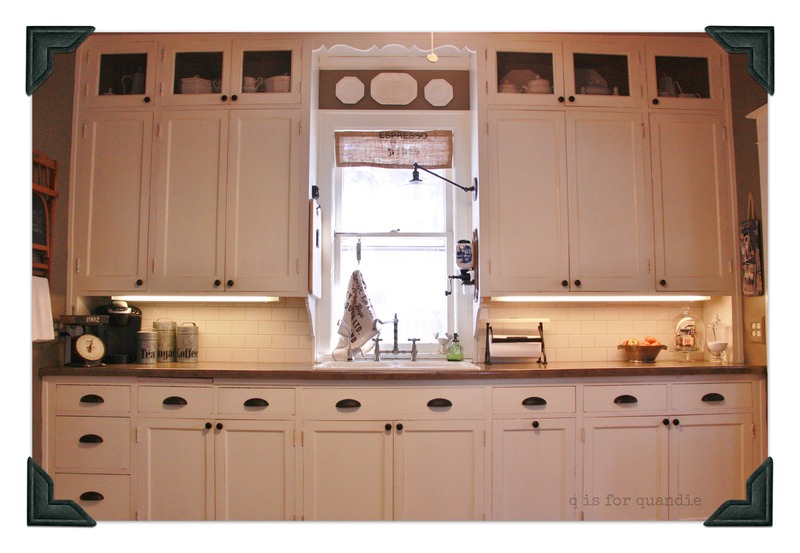 Your kitchen cabinets are to-die-for! I also like the deep wall color next to the cabinets. Very nice kitchen. Thanks Ginene. 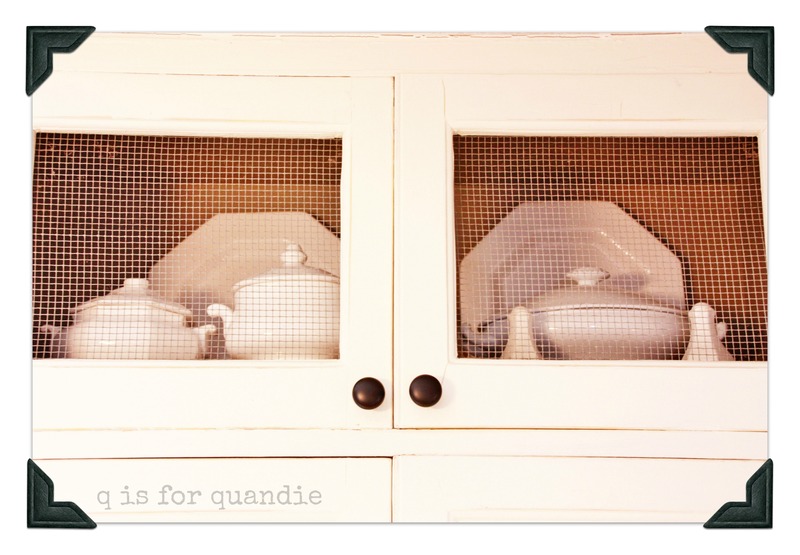 Considering my cabinets are over 100 years old, I think they have held up rather nicely. Which is probably more than you can say for any new kitchen cabinets! Those cannot be the original cabinets totally amazing. It’s really a perfect kitchen for your home so glad you did not abort the charm of its era. I just cannot wrap my head around the type of renovation. Like the home you picked up the Craigslist piece from. Like you iterated all lovely but so sad. I prefer the interior to reflect the architecture of the exterior more congruent IMO. By the way the floors are smashing as well as your accessories . Well, original cabinets but not original hardware. I changed out the hardware for the 4th time last year. But I think this hardware pays proper homage to the era. I love it. Every single word. Your kitchen is so entirely you and Mr. Q. I can attest as I have been the lucky recipient of that lovely wine and well treated cheese. Cheers! May there be much more of that. Thanks Lacq! There is definitely more shared wine and well treated cheese in our future. True. How many others can say their neighbor has a ‘drive thru’? You forgot that Mike has an AMAZING blender. I do believe that is the extent of your kitchen gadgets. I’m over visiting from Town & Country Living Blog – LOVE your floors, do you have a tutorial on how you did them? I am so doing this to my kitchen floor! Thanks Anne! I always feel like my license to blog is going to be taken away when I admit that we did not do the kitchen floor ourselves. We hired a wood floor guy. I can tell you how he did it though, sort of. He sanded the floors down to bare wood, he measured out the squares and taped off the dark ones, which he carefully stained dark. The lighter squares are just the natural unstained color of the wood, which I believe is maple. I have painted a couple of floors in the same pattern, one on my front porch and one in my photo cottage, so hopefully those projects re-qualify me as a home decor blogger! Obviously I have a thing for diamond patterned floors. Hi Linda! That color is by Behr and called Mocha Accent. I must warn you, it’s one of those colors that can really look different depending on the light. I would highly recommend testing a swatch in your room before you commit. I love the color in my kitchen, but when I tried to paint the same color in the piano room, it looked awful. Did you build or buy the shelf that your microwave is attached to? If you built it, would you mind sharing the instructions? I had that custom built specifically for my microwave by a real carpenter. So unfortunately I can’t share any instructions.